June 2016 - Maplewood of Sauk Prairie During the winter time, it is important to watch for ice buildup on steps and sidewalks. Gutters that drip can often be the cause of ice buildup and should be repaired. Sand or salt could also be applied. Someone should be dedicated to making certain that all sidewalks are clear from snow and ice. Proper Handrails Properly installed handrails can make a considerable difference for those who have difficulty with balance. By securing handrails at the proper height in the proper areas, this can prevent falls. 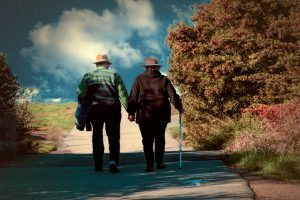 Use a Cane or Walker For those that have difficulty walking, it is often necessary to use a cane or a walker. These can be used for stabilizing the person while they are moving. Some are resistant to using a walking aid, but it may be time to have a discussion if that is the case. Bathroom Aids Installing bathroom aids like grab bars in the shower area can be a great benefit. These wet surfaces can be the perfect place for a slip and fall and any aid that can help to assist the person with standing or walking is a good thing. Watch the Floors Keep the floors clean of any objects that may cause a fall. Straighten rugs and remove any objects that may get in the way and cause a loss of balance and a fall. It is important to stay safe and prevent slips and falls at any age. But, it is even more important to take steps to prevent those that are especially at risk for falling.